Specifically, for $44.95 you can purchase the premium edition of the downloadable do-it-yourself Washington Limited Liability Company kit and then immediately download a 20+ page pdf document. 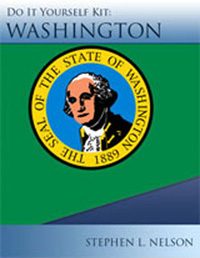 The PDF document describes the benefits of using a Washington LLC for your active trade or business and then the kit explains in step-by-step fashion how to set up your Washington limited liability company in a few minutes, how to get a federal tax identification number for your new LLC so you can start banking and other financial activities, and how to elect to have your LLC treated for federal and state income tax as an S Corporation so you can maximize your tax savings. The economy kit also comes with two sample LLC operating agreements--one for LLCs with a single owner, or member, and one for LLCs with multiple owners, or members.